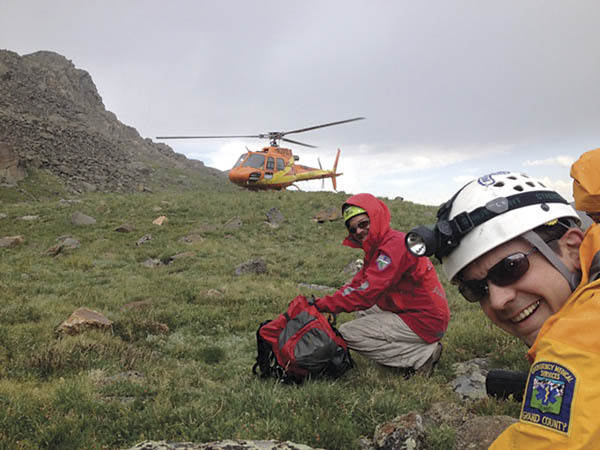 Courtesy of Grand County Search and RescueRescuers near Rollins Pass helped lower a 60-year-old Denver woman to an air ambulance who was injured when she slid down a steep snowfield. Grand County Search and Rescue responded to two rescue calls on Wednesday, July 18, including extricating a woman who was injured after sliding down a snowfield near Rollins Pass . At 10:51 a.m. the team was notified that a 60-year-old woman had fallen on a snowfield near King Lake, which is in Boulder County north of Rollins Pass. Janeen Ledford of Denver was hiking with three friends along the Continental Divide north of Rollins Pass. The group tried to descend into Boulder Creek where they encountered a snowfield. When Ledford lost her footing while trying to cross the steep snow one of her companions reached out to hold her up. Both of them slid about 200 feet down the snowfield, crashing into the rocks at the bottom. Ledford’s friend was uninjured, but Ledford “jackknifed” when she hit the rocks and tumbled another 40 feet across the talus, sustaining multiple injuries. The group was able to make a 9-1-1 call. Rescue teams were scrambled from Grand and Boulder counties. A Flight for Life helicopter picked up a Rocky Mountain Rescue Group member in Boulder and was able to locate Ledford and her group. The helicopter was able to land about 1,000 feet from Ledford, below the headwall, and drop off the rescuer and a flight nurse. Six additional Grand County rescuers with technical and medical gear, including two EMS medics, were air-lifted from Rollins Pass to the accident site. A ground team stood by at the Pass in case the helicopter evacuation was unsuccessful. As an impending thunderstorm approached, the rescue team hustled to lower Ledford down to the waiting helicopter. One pitch required the use of a rope to lower the litter. Once Ledford was airborne and headed to Denver, the rescuers hiked out to Rollins Pass. Later on Wednesday, at 5:45 p.m., a second page called the team to the stables at Snow Mountain Ranch where a woman had fallen from her horse, location unknown. Melanie Waz-Stern, 48, was found a short distance from the stables by staff members just as the first rescuers arrived on scene. She was laying on the trail, unconscious, with multiple injuries. Apparently, her horse had fallen on her during the accident. The horse was nowhere to be seen. Ambulance crews were able to drive right to Waz-Stern, a Grand County resident. She was airlifted to St. Anthony’s Denver by helicopter from the accident scene.